One day, maybe 20 to 30 years from now, there well could be reusable space, military and commercial vehicles powered by scramjet technology. They�d be much smaller, simpler and more affordable than today�s rocket-powered vehicles. These hypersonic air-breathing vehicles would travel at speeds between Mach 5 and Mach 10 �five to 10 times the speed of sound. A commercial airplane with scramjets would be able to fly from Seattle to Tokyo in a little more than an hour. When future historians write about the development of scramjet technology, they could look back to 2004 as a key turning point. That�s when NASA and an industry team that includes Boeing Phantom Works completed some key initial milestones with two successful flight tests of the X-43A Hyper-X research vehicle. Launched from a B-52 high over the Pacific Ocean in March 2004, the 12.3-foot-long (3.75-meter), unmanned X-43A fired up its scramjet engine and flew at Mach 6.83, or about 5,000 mph (8,150 kilometers per hour). It later flew at Mach 10, or about 7,400 mph (12,000 kilometers per hour) in November—five times faster than a speeding bullet. Both flights were record setters. They recorded the fastest speeds ever achieved in flight by an air-breathing vehicle. But more than that, the flights demonstrated that scramjet technology worked. All the research and development in hypersonics from the National Aerospace Plane program from 1986 to 1995 and the X-43A program from 1995 to 2004 had transformed what some considered a pipe dream into reality. 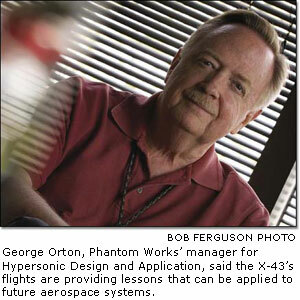 Two interested observers of the X-43A tests were George Orton, Boeing Phantom Works manager for Hypersonic Design and Application, and Harvey Schellenger, Boeing Phantom Works program manager for the X-43A. 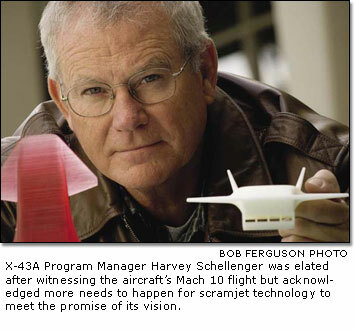 “I wanted to do a backflip,” Schellenger said after witnessing the X-43A’s Mach 10 flight. But he acknowledged a lot more needs to happen for scramjet technology to meet the promise of its vision. That’s how George Orton, Boeing Phantom Works manager of Hypersonic Design and Application, described what happens when scramjet engines are fired up in an air-breathing vehicle flying at supersonic speeds. According to Orton, the scramjet is a “very simple device.” It does not use compressors and it does not use turbines that a conventional jet engine would use. It does have a combustion chamber where fuel is injected, mixed, ignited and burned. That’s all done with air flowing through the engine at supersonic speeds. The air enters the engine after it is compressed by the forebody of the vehicle, along the lower surface. After the air and fuel are mixed and burned in the combustion chamber, the air expands in a nozzle in the aft end of the vehicle to produce thrust. Liquid fuel is circulated through the engine structure to cool the engine, where it is conditioned to a gaseous state before injection into the combustor section. One of the benefits of scramjet engine technology is that the engine itself has no moving parts. This is because the speed of flight, not multiple fans, compresses air in the engine’s combustion chamber. Another benefit is that scramjets will allow for the design of smaller, simpler, more affordable reusable vehicles for potential space, military and civil applications. For unlike conventional rocket engines, scramjets don’t require oxidizer to be carried on board for combustion. There are two schools of thought on how a hypersonics vehicle would get from the ground to the upper atmosphere using scramjet engines, according to Harvey Schellenger, Boeing Phantom Works program manager for the X-43A. “One view says you can put it all into one big airplane and go fly it as a single stage to orbit,” said Schellenger. That was the concept behind the National Aerospace Plane program that ended in 1995, he added. Some two-stage applications—specifically for NASA and the U.S. Department of Defense—might use a third stage with rockets for a final boost into higher orbits. However, such rockets wouldn’t be needed for commercial applications because the vehicles would cruise at high supersonic speeds in the upper atmosphere. Either the single-stage-to-orbit or the two-stage concept is achievable, Schellenger and Orton agreed. 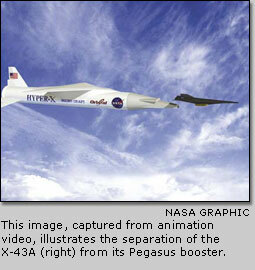 One of those applications is a follow-on program to the X-43A called the X-43C. Thanks to a funding request of $25 million for NASA sponsored by U.S. Rep. Jim Talent (R-Mo. ), work on the X-43C program will continue through 2005. The final design of the X-43C is not settled yet, Orton said, but there are some details that can be discussed. The X-43C will be slightly bigger than the X-43A and will carry multiple engines rather than one engine. It will use hydrocarbon fuel—which is similar to the fuel used in current jet engines—rather than the hydrogen fuel used by the X-43A. The X-43C also will be able to fly on its own for several minutes rather than just a few seconds. And it will demonstrate propulsion technology applicable to future hypersonic aircraft and air-breathing space launch vehicles. Boeing Phantom Works is working on two other hypersonics programs in addition to the X-43C. Boeing and Pratt & Whitney are developing the Scramjet Engine Demonstrator-Waverider for the U.S. Air Force and the Defense Advanced Research Projects Agency. This demonstration program will provide technology that someday could be applied to aircraft and air-breathing vehicles that would reach space. A Boeing Phantom Works team in Huntington Beach is responsible for vehicle design, while Pratt & Whitney is supplying the scramjet engine. Waverider’s first flight is scheduled for 2008. A Boeing Phantom Works team in St. Louis also is under contract with DARPA and the Office of Naval Research to design, develop and flight-test the Hypersonic Flight, or HyFly, missile demonstrator. HyFly will be powered by a Dual-Combustion Ramjet, or DCR, engine. Boeing’s principal subcontractor on HyFly is Aerojet of Sacramento, Calif., which supplies the DCR engine. The HyFly program team also includes the Naval Air Warfare Center–Weapons Division at China Lake, Calif., which provides the solid rocket booster, and the Johns Hopkins University Applied Physics Laboratory, which provides technical support and testing. 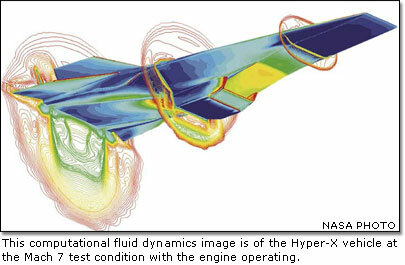 The HyFly program’s objective is to mature the dual combustion, ramjet-based, hypersonic strike missile concept. Flight tests will feature a weapon configuration that’s compatible with launch from surface ships and submarines as well as U.S. Navy and Air Force aircraft. First flight is scheduled for 2006. Both the Waverider and HyFly projects involve the use of hydrocarbon fuel. In characterizing where scramjet technology is in its development, Orton drew a parallel with an earlier era in aviation history. “We’ve just taken the first baby steps with the scramjet, which is sort of at the same point that jet engine technology was just before and during World War II,” he said, noting that scramjet technology could have high payoffs in the future for both military and commercial applications.